This Anime is about a card game. Nothing grabs your attention like such a lame basic plot, huh? Well, I actually really enjoyed this show. When I first started watching I was thinking, “yeah whatever. They will follow the card game for a few episodes but the rest will be about romance or whatever.” Wrong. Then I figured, “alright, it’s about a card game. It can’t go past 12 episodes.” Wrong. 25 episodes, per season. And there are two seasons. Before I go any further, lets talk briefly about what card game they are playing. Karuta (かるた), is a Japanese card game that has been played by people of all ages. Some play it in school as a learning exercise and some play it professionally to become the top player of the nation. Karuta as a competitive game has been around since the 19th century, but has become far more formal in the past 75 or so years. In terms of competitive playing, think of it like American poker. I don’t play or follow poker but I know there are some seriously big tournaments that happen. I mean, there is a Poker channel. In competitive play the game of Karuta is made up of 100 poems. Each poem is identified by a card, for 100 cards. In reality there are 200 cards, but only 100 are used by the players and contain only the last phrase of the poem. The other 100 cards are used by the reader and contain the full poem. In this sense think of it kind of like a game of Memory where instead of taking turns a single person tells you what card to find and the first person to find it wins that card. At the start of the game each player is given 25 random cards from the player deck and they lay the cards out on their side however they wish. This means you can’t just memorize the playing field one time. It changes each time you play. It can also change during game play, so you need to be able to both memorize and forget quickly. It also means there are 50 “dead cards” that when read have no corresponding card on the playing field, so you have to be careful. Anyway, back to the review of the Anime itself. As I said, knowing this much about the game (I researched after the first episode because I was curious about the game too) I figured there is no way the entire show can be about the game. I mean, that is like an entire show about poker. Yes it happens but you don’t watch unless you already love poker. 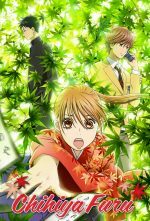 I was pleasantly surprised that Chihayafuru actually kept the game in the center of everything they did. Again since the closest equivalent we probably have in America is poker, it gave me a new understanding of what people who play poker seriously actually go through to become the kind of player they are. The show primarily follows 5 high school students as they create a Karuta club and then move on to playing professionally. The show actually does a really good job of showing the kind of hard work that has to go into achieving a dream like becoming the best Karuta player in the nation (or world, since it really isn’t played elsewhere). At times it can be terribly slow, but the truth is doing something you love can be terribly slow as well. You can’t get perfect grades without putting in some hard study time. You can’t go on a great vacation without doing some work ahead of time to plan (some) things out. This show does a marvelous job of showing the kind of hard work that goes into getting better at something. While there are some hints at possible romance in various episodes of the show they never go there. The writers never turned it into a romance comedy nor even tried to use a few episodes to lighten in up that way. They simply followed the game. Followed the kids on their quest to become better players. Perhaps the lack of romance is why the show was so clean. I would venture to call it perfectly clean because I don’t remember a single inappropriate visual. And language was surprisingly clean too. I do not recall for sure, but if there was language it was rare. Probably the most prominent character in the show is Chihaya, who played Karuta when she was a young girl and fell in love with the game. Now in high school she wants to start a Karuta club and tries to get one of her friends who used to play the game with her when they were children to join. They also need another three members before they can be an official club. Finding members is difficult when you are a club for a “child’s game” that most people stopped playing before middle school (who still plays Simon Says in high school?). As an American who knew nothing about the game before watching this show, it was very interesting getting to learn about a Japanese card game that is actually played in competition as well as recreation. Learning how the game works, the rules of the game, even the competitive rules for how people advance and compete for the national title. The practice, memorization, learning what the poems mean. The endurance required. A single game can take an hour. A competitive match can last all afternoon with only a few short breaks while you wait for the other players to finish their games. If this sounds like a documentary, don’t worry – it’s not! At one point, I believe a single game lasted 3 episodes (really two episodes, last half, one full episode, first half). That is not to say it was just 45 minutes of watching them play. During the game the scriptwriters do a good job of giving you insight to what the players are thinking. How they are learning from their mistakes and the mistakes of their opponents. You learn about the characters habits and how they become better players. While this is not a hyped up action adventure show it is still very interesting to watch, especially if you are looking for clean anime with a good storyline. And finally, if you want a taste of what Karuta is actually like, check out a few minutes of these two youtube videos. The first is the 2014 match for the title of Meijen (Master) in all of Japan (don’t blink!). The second appears to be a home video recording of an intra-city competition or something. It gives you a better feel for what happens in large group competitions. And also why these competitions can take so long. I’m sure it is easy to think something like that doesn’t take much stamina. Try to imagine how much stamina you need to sit through a 2-hour interview where your prospective employer asks you a question, lets you respond and then just sits and stares at you for 2 or 3 minutes before asking the next question. It is a tense situation while you try to stay focused and not lose your nerve. Summary: Great clean show with a decent storyline. Follow five youths as they try to become Karuta champions. You get to learn something about Japanese culture too! Language Content: Clean, possibly a few swear words muttered but nothing jumps out at me. There is swearing in most if not all episodes, and one bath scene as far as I could see. Quite a bit of language while playing the game, and just in ordinary talking, but it was a very good series as long as I watched it.